Version 2 brings many improvements starting from the powerful Edge and Tone Preserving tool and the Quick Decompose function. The Decomposition button is the exclusive feature of Wow! Frequency Equalizer Pro. You can now explicitly turn each frequency into its own pixel layer (five of them are created in a stack, plus a base layer) for a better and more precise frequency based retouching. 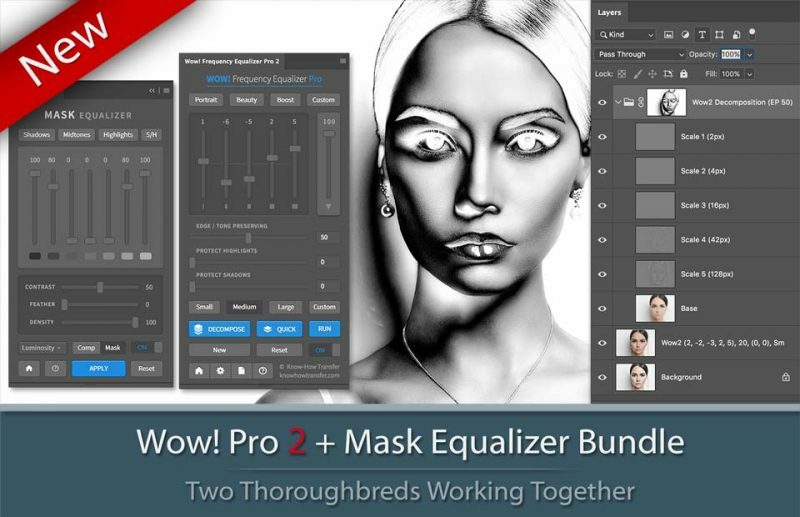 MASK Equalizer is an exclusive Photoshop plugin to preview edit and create masks using multiple luminoity ranges. Choose between our presets, to create a mask with just one click. Modify the masks using sliders or manually create custom ones from scratch. Preview live both the mask or the image with the mask applied, modify the opacity of the mask, feather it or modify its contrast.